Fresh eyes on London: What page did you say? What page did you say? Flicking through the paper in Soho. What a sweet little man and lovely green shop! What a perfect little picture. 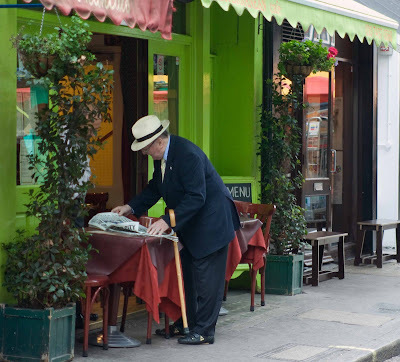 The man with the cane and that fantastic hat, the green color of that building, the red of the tablecloth. This is a great shot. A great shot MO. The green is the piéce de rèsistance. Or maybe it's the hat. "Louis" hopes you are over that cold! He is very dapper! I like his hat. I agree with Wayne, the green the hat and the red awning and cloths. The very best is this charming dapper little man with his cane! I love this photo. What a great catch. Do men still wear those hats. A very nostlagic english image. It's cheaper than paying for a cup of tea too! I love that shot! Poking through your last month's work makes me want to visit a couple of our kids living there! Your photographs make me homesick for a place we've never called home. The colors are astounding and he looks like a delightful chap!